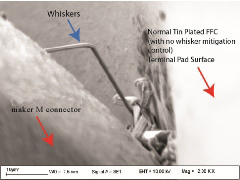 Lead co-deposition as an alternative of Tin Whisker mitigation has become obsolete as a result of RoHS directive on Jul 2006 that restricts the use of lead (Pb). 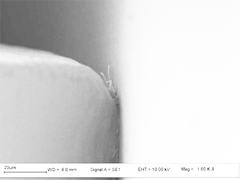 Current methods for Tin Whisker mitigation strategy which uses Gold (Au) plated on a layer of Nickel with the based copper (Cu) conductor wire terminals of Flexible Flat Cable (FFC) is effective, but becoming uneconomical as gold price has increased over four folds over the past 10 years. This provides the impetus to perform research and development into other methods of Tin Whisker Mitigation which is effective, economical and yet environmentally friendly. 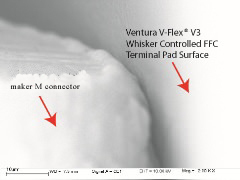 JSB Tech developed another breakthrough UL Standard, Ventura V-Flex® V3 Whisker controlled FFC (within INEMI Class 1 Standard) employing Annealing method for Tin-Whisker mitigation technology which is effective, economical and environmentally friendly.